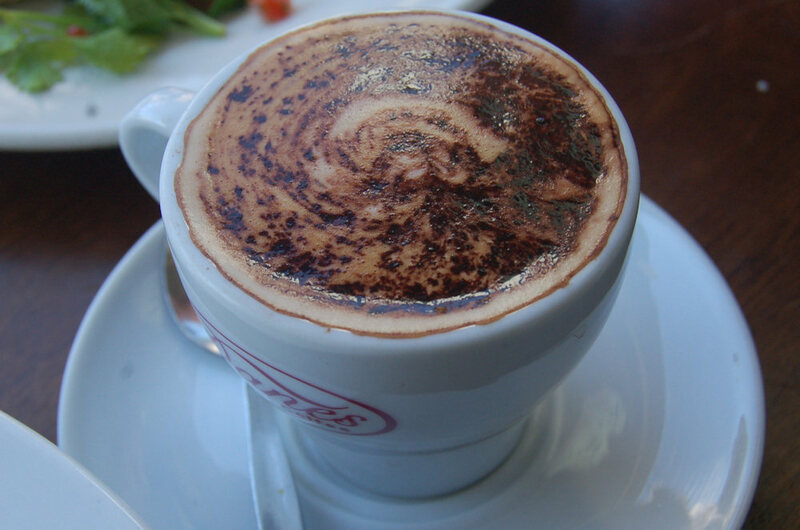 While April took the healthy route this week and ran in the City2Surf, Dane continued on the SOS café quest. Newtown was the choice this week and I thought it was apt to visit a café that took it upon itself to represent the entire suburb through its name. 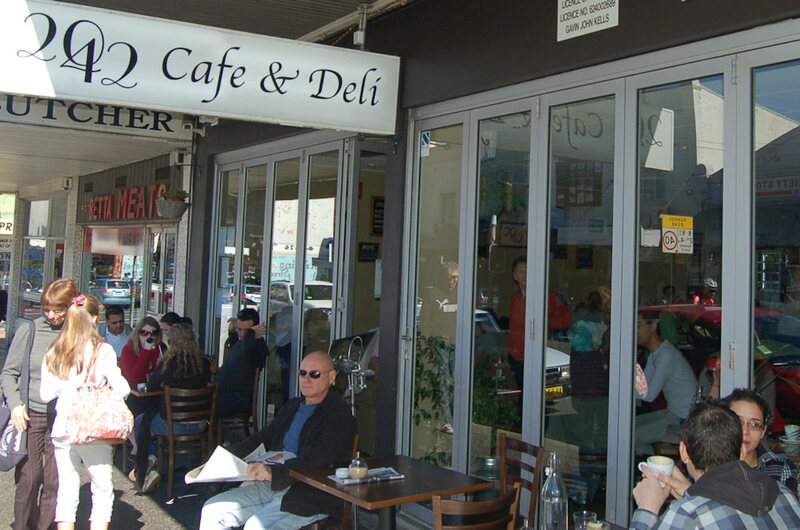 You need to venture past the central Newtown area to find 2042 Café & Deli. 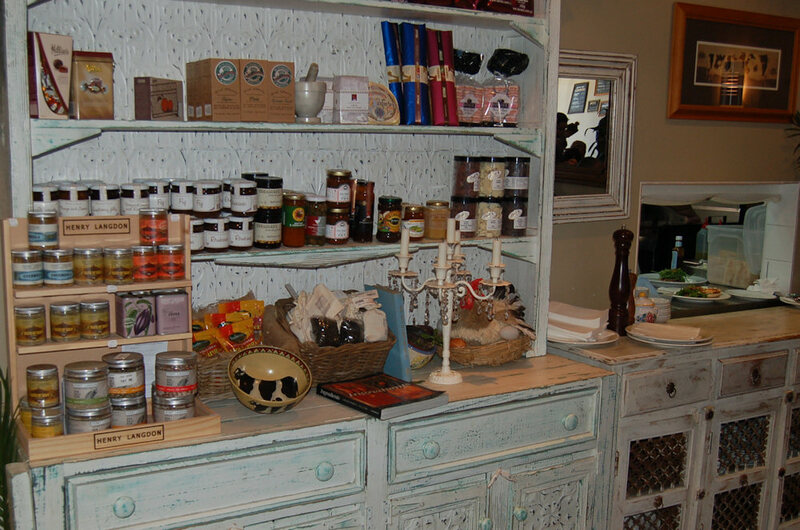 Amongst the vintage, antique and button shops (no we’re not kidding, there’s a button shop) are some fantastic cafés. Seating on the sidewalk is limited but there is plenty of space inside including some very comfortable sofas. 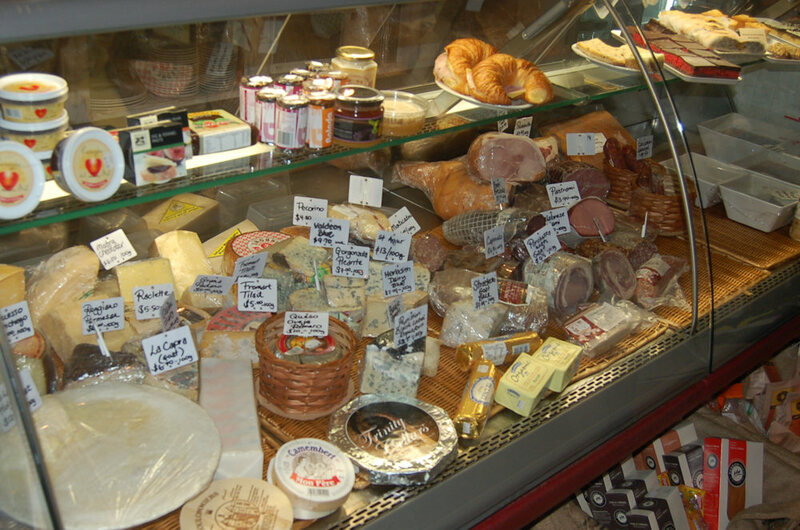 For food lovers there’s plenty to look at and buy. From the meats to the jams, everything looked superb and a little bit different to what you’d normally buy in the supermarket. As well as the above, we also saw ice cream, olives, “healthy florentines” and teas. The waitstaff were amongst the best we’ve met. They were professional, friendly and courteous. Seating us very quickly with a smile, we received menus and cold water almost instantaneously. We were served by a few people but the waiter that was with us the majority of the time was an extremely helpful and genuine soul. Coffee after my own name. “It better live up to it!” I thought. The mmms after every sip told me that it did. There was high praise from the coffee drinkers at the table as they enjoyed their skim cappuccinos ($3.50). Two varieties of freshly squeezed juice are available: apple and orange ($4.50) as well as bottled orange, apple, pineapple, cranberry or grapefruit ($3.90). 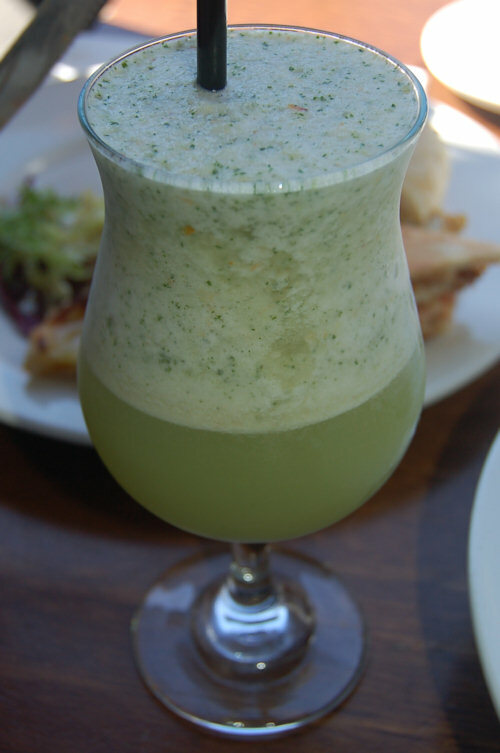 I chose one of the two frappes on offer: lychee, mint and pineapple ($4.50). This frappe contained less ice than I’m normally used to but the blend of fruit tasted fantastic. The top was frothy but still juicy and thirst quenching and the lychee flavour gave it a real boost. I wish it was more common in fruit drinks. The name of the dish pretty much says it all. 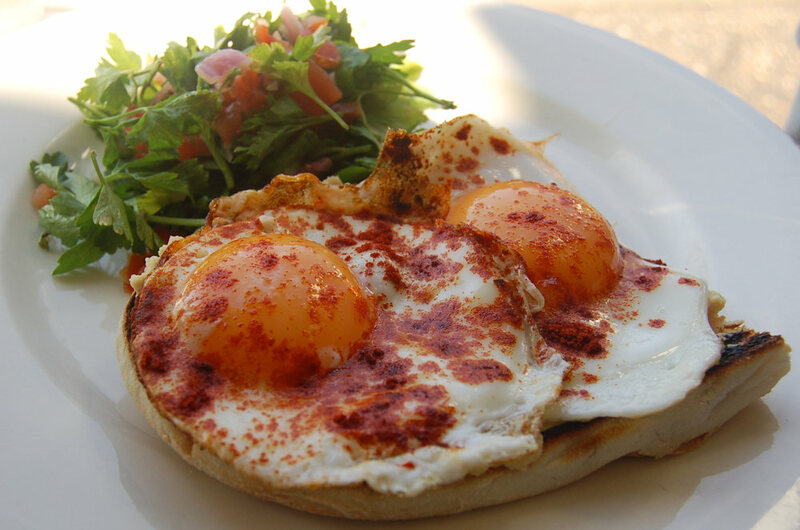 The fried eggs on toasted Turkish with hommus, parsley salad and smoked paprika ($11.90), althought not my cup of tea, was just what one of my guests wanted. She praised the combination of the parsley salad with the smoked paprika. The egg yolks were just soft enough to run when cut and unlike many of the cafés of late we could actually cut through the bread easily! 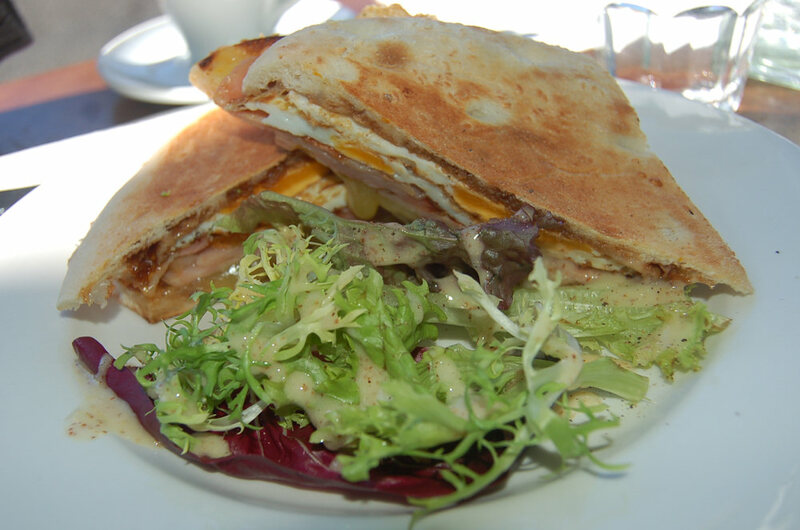 This was another café that really takes the simplicity of the bacon and egg sandwich and does great things with it. However rather than spicing it up with unusual ingredients as we’ve seen in the past (not that that’s a bad thing), 2042 perfects the flavours of their fried eggs, bacon & cheese with BBQ sauce on Turkish ($9.90). There were generous amounts of egg and bacon which was made even more decadent with melted tasty cheese. We found it hard to fault: filling, tasty, simple and well presented. 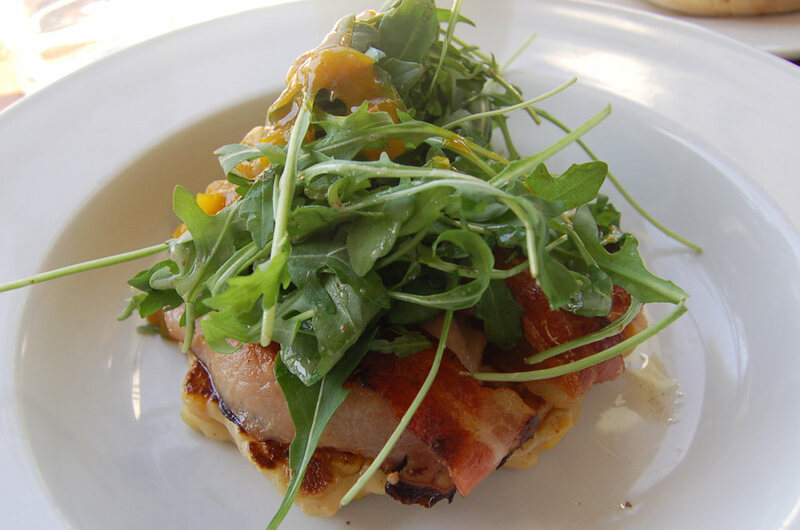 The corn & ricotta hotcake with bacon, rocket and green tomato relish ($14.90) presented a unique twist on the now ubiqitous ‘corn fritters’ and varieties thereof. The hotcake alone was a warm, moist and delicious item. The bacon above went with it very well but it was the rocket and the green tomato relish that gave the dish a whole new flavour. What looked much like a mango chutney can best be described as picalilly but with more of a curry flavour. I found myself using every last piece of food to spread the relish over as it quickly became my favourite taste at the table. Much like the fried eggs and paprika, the flavours of the hotcake dish were not to everyones’ taste but luckily we all ordered well and according to our own preferences. Based on that, 2042 Café & Deli receives very high marks in all areas. The prices were also remarkebly reasonable which was a welcome change. I’ve never been so happy to hand my credit card over when I was being charged $42 for food of this quality for three people! Enjoying breakfast at 2042 means you have the rest of the day to enjoy the sights and sounds of Newtown. There are shops for all tastes, fashions and hobbies so be sure to soak up as much of the King Street culture as possible. This entry was posted in Sydney - Inner West and tagged Dog friendly, Organic Options, Outdoor seating. Bookmark the permalink. I love 2042, and lucky for me it’s only a few minutes from my house. If you go there for lunch/dinner try their brownies, so good! You guys’ cafe review’s been great! I’m gonna take my Japanese friend there when she visits in few weeks time.